Because they are such a valuable genealogical asset, it is worth singling out obituaries for separate consideration. Newspaper obituaries were commonplace during the 20th century, less so in the late 19th century, and rare before that. 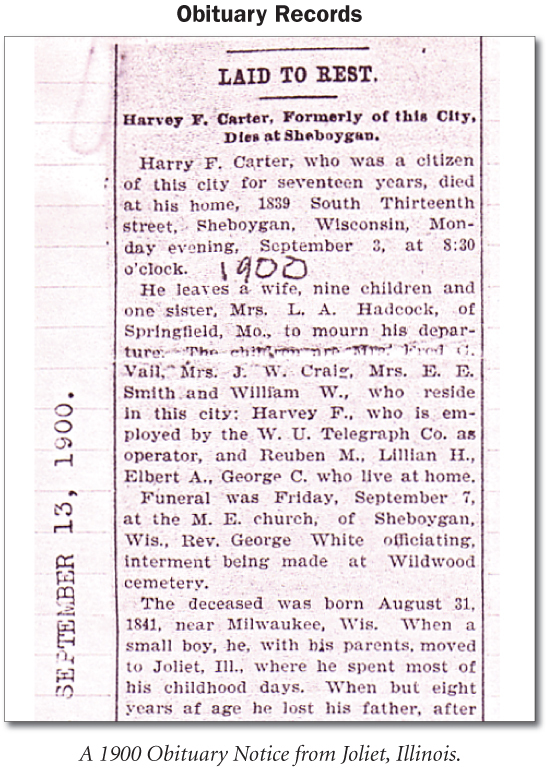 Obituaries, while not always completely accurate, are often a genealogical jackpot. They sometimes provide the date and place of birth of the deceased (especially valuable for immigrants), parents’ names, and/or the names of siblings and other kin. This information can be used to track descendants of your ancestors (hence, your distant cousins) who may hold other pieces of your common genealogical puzzle. More recent obituaries also frequently mention the occupation, last residence, military service, or social and church affiliations of the deceased. The funeral home or cemetery and other details that can lead you to additional records may also be included. Due to their widely recognized value to so many genealogists, more and more obituary resources are appearing online, often in conjunction with cemetery records. 2) Internet — some obituary records are online. Go to http://www.cyndislist.com or http://www.usgenweb.com and check your location.